Good question, Debbie. And here are a few thoughts, which I hope will add up to a good answer! One key thing to remember when you're training - whether a puppy, a new dog, or a dog you’ve had for years - is variety. Dogs, like us, are easily bored. So you want to keep sessions short, be unpredictable, and move fast through your training. This means you’ll need to do some planning. Some people like to keep a detailed training planner and diary going, while some prefer a more inspirational approach. This is fine if it works, but you may spend half your allocated time dithering and wondering what to do next. So a little tiny bit of planning goes a long way. A simple way to do this would be to list the things your dog knows, and then list the things you want to teach, broken down into tiny steps. You can see where these overlap (teaching a down stay requires … a Down!) and then pick one from each column for your session. 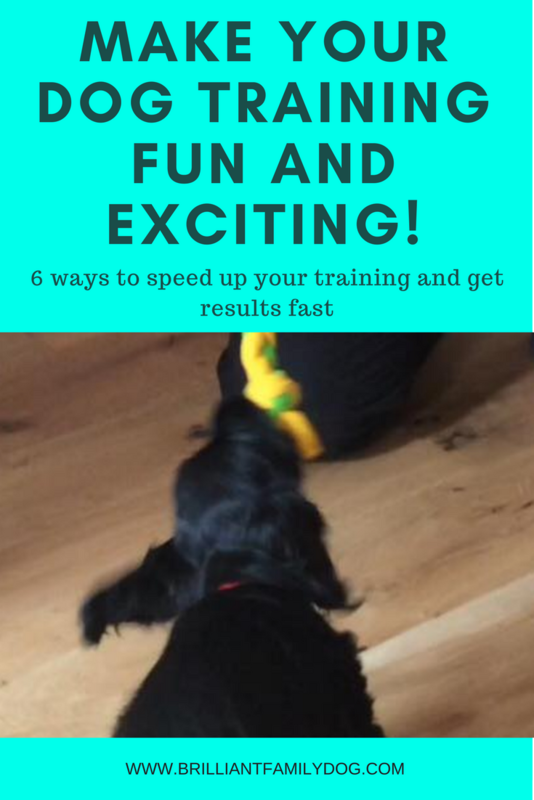 You can start off doing a few lightning fast reps of something your dog knows (I hope I don’t have to add “and enjoys” - should be part and parcel of the training), then move into teaching one little step of the new thing. You can vary your rewards - perhaps kibble for the thing he’s already good at, and top treats (cheese, sausage, etc) for the new thing. Always end with a game - even just “Chase me round the garden” is a good game - and make sure your session was very, very short. For a young puppy, ten treats or one minute is plenty; for a more experienced dog you could extend that to three minutes. But not more. Having some good food ready chopped up in the fridge will make spontaneous sessions much easier. We all live very busy lives - there's no need to make a big deal of a little training session. Most of my training takes place in short, spontaneous bursts wherever I happen to be when the humour takes me. My dogs are always ready to have a game with me, and there is never a time when they cannot earn a reward for something I like - so they’re up for the challenge! And if you like checklists, you can put a big tick next to what you’ve done. How boring would training become - for both you and your dog - if you always did the same thing? Keeping with our Variety theme, you can choose a different pair of things to train next time, till all your items have a number of ticks by them. Now it’s time to make a new, revised pair of lists! Even a very young puppy can learn to enjoy an exciting game with you. Loki is 10 weeks old. Along with Variety goes Unpredictability. Who wants to do the same old thing over and over again? And if you stick to doing the same step and never advance it, you’re in danger of your dog getting stuck at that stage and thinking that’s the whole deal. So while you want to keep known actions going, and allow your dog to enjoy knowing what comes next, you also want to pique his interest by keeping him guessing, always pushing on a little bit towards the finished action or trick (it’s all tricks to them). One day you may be training in your kitchen. Another day you do the same session in the garden. Harder? I’ll say! Your dog has to learn that what earnt him a reward in the kitchen is also guaranteed to work in the garden, or on a walk, or at a friend’s house, and so on. This is called “Generalising the behaviour” if you want to get technical, and it shows your dog, in Sue Ailsby’s words, that “Gravity still applies” even in a different place. If you were to work on two tricks - say a Spin, and a Roll over - in the same session, there is a danger of thoroughly confusing your dog, to the extent that you end up with a kind of twisting rotation in the fourth dimension, where he muddles up all the actions. So choose two tricks that align with each other perfectly (a Down leading on, after a break, to a Roll over, for instance) or two tricks that totally contrast and cannot be muddled up (maybe a Sit Pretty and Take a Bow). A common complaint at class is that the dog sits, then immediately lies down. Clever dog! This is the direct result of teaching a Sit followed by a Down. Your dog is just anticipating the next step and getting there first. Dogs love knowing what comes next! So actions like this should always be taught separately. A fast sequence of “Down, Sit, Sit Pretty, Down, Stand, Down, Stand, Spin” but always varying the order, will teach your dog to listen to what you’re saying and watch the signal you’re making, and not just guess or anticipate. And what if the dog does anticipate you and make a mistake? This is a bit like the children’s game of “Simon Says”. The dog isn’t wrong - he’s just not right! So ask him “What should you be doing?” and see if he can put himself right. If that’s too hard, just toss a treat away for him, use it as a re-set button, and try again. He missed a treat when he gave the undesired response, so if your timing is right he’ll now be dying to get it right and earn his reward! Remember that you need to break everything down into its separate parts. You can’t teach a dog an accurate, fast, trick all at once, in one session. Parts are going to be woolly and unsure, and it’s getting every part accurate that results in a firm understanding that will keep your trick alive and correct for ever. Whirling fast through it all will result in insecurities, and the trick will break down. Much easier to go slow and get it right - at every stage - from the start. So “Patience, Grasshopper”! Make haste slowly, be fussy about precision, and ensure each corner is negotiated with understanding before finalising the whole sequence. 6. The best teachers .. The best teachers combine a little of a few things, to keep the student alert, and to demonstrate that they can incorporate their former learning into new things. So the schoolteacher may design a project which requires the student to plan, make choices, write, do some calculations, and maybe construct something. As your dog’s repertoire grows you’ll be able to do similar things. You may start your session with some exciting play with impulse control, followed by a bit of attentive loose lead walking, a sit, then a thrilling fast recall. So to go back to Debbie’s good question of whether to teach things one at a time or all at once, the answer is … BOTH! Ideally you are building up your dog’s knowledge by working on several different, unconfuse-able, areas (hence my books cover four essential but totally different skills), but you are doing this in baby steps, moving each thing forward a little at each training session. As the understanding gained from learning to keep still in Calm Down! will inform the thoughtfulness needed to Leave It!, and the focus needed for Let’s Go! will spill over into your dog waiting attentively to hear his precious name being called (Here Boy!) it’s a win-win all the way. As your dog learns more of these skills, you’ll find training more fun, more challenging, more rewarding, and your relationship with your dog will build and build! Are you a Firefighter or a Planner?